Isaac Asimov ( /ˈaɪzɪk ˈæzɪmɒv/ EYE-zək AZ-ə-mov; abiso Isaak Yudovich Ozimov; Rọ́síà: Исаак Юдович Озимов; c. January 2, 1920 – April 6, 1992) je olukowe ati ojogbon ara Amerika ninu eko ipoogun-alaye ni Yunifasiti Boston, to gbajumo fun awon ise re ninu adako sayensi ati fun awon iwe sayensi agbajumo re. ↑ 1.0 1.1 Asimov, Isaac. In Memory Yet Green. "The date of my birth, as I celebrate it, was January 2, 1920. It could not have been later than that. It might, however, have been earlier. Allowing for the uncertainties of the times, of the lack of records, of the Jewish and Julian calendars, it might have been as early as October 4, 1919. There is, however, no way of finding out. My parents were always uncertain and it really doesn't matter. I celebrate January 2, 1920, so let it be." ↑ Pronunciation note: In the humorous poem "The Prime of Life" published in the anthology The Bicentennial Man and Other Stories, Asimov rhymes his name thusly: "Why, mazel tov, it's Asimov". 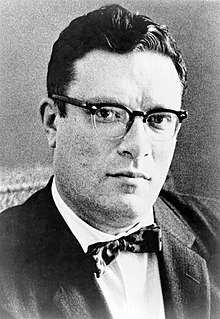 In his comments to the poem Asimov wrote that originally it was "Why, stars above, it's Asimov", and when someone suggested to use "mazel tov" instead, Asimov accepted this as a significant improvement. Àtunṣe ojúewé yi gbẹ̀yìn wáyé ni ọjọ́ 5 Oṣù Kẹ̀sán 2013, ni ago 08:54.